Yesterday, we discussed the background of how Lily became lost. Today, we are going to focus on tips and techniques on finding your lost dog based on our experiences on how we found Lily through Community, Prayer, Relentlessness, and Scenting. Never underestimate the power of a united community. The people of Birmingham are the reason why we have our dog with us today. There are two ways to utilize your community. First, contact all of your family and friends who live in the area. We are extremely blessed to have some amazing people in our lives, because our family and friends hit the streets the moment we called them and they didn’t go home until we found our dog. The key is to have as many people out looking as possible. Second, social media, social media, social media! Social media is an unparalleled community resource. Make a lost dog flyer and post it anywhere you can online. Then beg everyone else to post the flyer anywhere they can. Use Twitter, Instagram, Facebook, Nextdoor.com, and every lost pet website there is. *The key to posting missing dog flyers on social media is to keep them updated. Any time we had new information about Lily’s location I would create a new flyer so everyone would have live reports on her whereabouts. We have some great community social media accounts like Dogs of Bham, Instagram Bham, Buy Local Alabama, Discover Birmingham, James Spann, and Scott (Reg) Register just to name a few. The people who run these accounts were a catalyst to a social media takeover for our dog-hunt. One person told me that Lily was the most sought after dog in Birmingham, and I believe it! But here’s the amazing thing: people—friends and strangers alike—saw the flyers and actually went out to help us look! They spent hours of their day on foot, in their cars, and on their bikes helping us search. Allan and I would like to thank those people again—from the bottom of our hearts, THANK YOU. 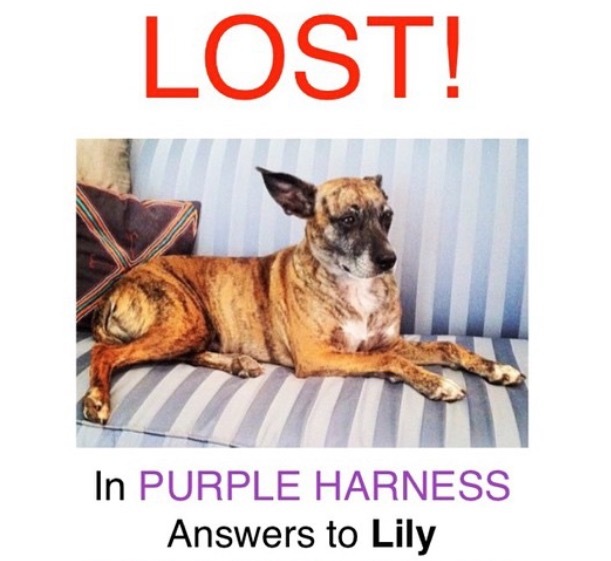 Example of flyer (included contact info and where Lily was last spotted). When you lose something you love you find yourself praying a lot, if you’re a person of faith. We began every day of our search by asking God to give us wisdom on where to look for Lily, and to guide us in the right direction. We asked God to calm our anxious and worried hearts and to keep Lily calm, safe, and alert. I honestly believe that God heard and answered our prayers. When we found Lily she didn’t have a scratch on her. She dodged cars for three rush hours and spent four nights on her own downtown. God knows our hearts and He hears our prayers! A very important key to finding your lost dog is relentlessness. It’s physically and mentally exhausting to conduct a several day dog-hunt, but you have to do it. If your dog is lost in the city it isn’t going to just wander back to your building and sit on the sidewalk waiting for you to pop outside and spot it. They’re going to be on the move and you’ve got to go find them. Maybe if you live on a lot of land or in a low-traffic neighborhood, you can rely on your dog’s sense of smell and on flyers to find your pooch, but every minute that your dog is lost in a city is even more dangerous. Allan and I spent every waking moment looking for Lily from Thursday night to Monday morning. Take a vacation day from work if you have to. Take two. Do whatever it takes. Establish a team to help you. You will need to spend all of your time outside so your dog can smell you, see you, and hear you. Ask someone else to be in charge of calling local shelters and vets. Ask another person to be in charge of updating social media. Ask a third person to make copies of your flyers for distribution. You should delegate as many tasks as you can. That will free you up to spend your time out on the street searching. If the sun is up, it’s your responsibility to be looking for your lost dog. Finally, the magic trick: scenting! Dogs have an incredible sense of smell. Once we had a good idea of where Lily was camped out we set up a little hub that we hoped to lure her to. There was a patch of pine straw next to some air conditioner units where she was seen over the weekend. We put one of my unwashed sweatshirts in the pine straw along with a pair of my used socks. Clothing that smells strongly of you is key. We also set out a large bowl of water, but no food. We didn’t want any other animals to be drawn to the food and risk Lily losing control of the territory. Finally, we marked the area with urine. We had our other pup pee all around the area to establish her scent for Lily. Then we sprinkled my husband’s urine all around the area. We also made trails of the urine coming from all directions, leading to the hub we built for her. Yes, we were the ones walking around Southside with the water bottles full of urine. But I would do it again 100 more times if I had to, because it brought Lily home! The next morning as the sun was rising, we drove over to the spot and there she was, sleeping! Right in the spot we built for her! Once she saw us she ran right to us and has been cuddled up next to us ever since. 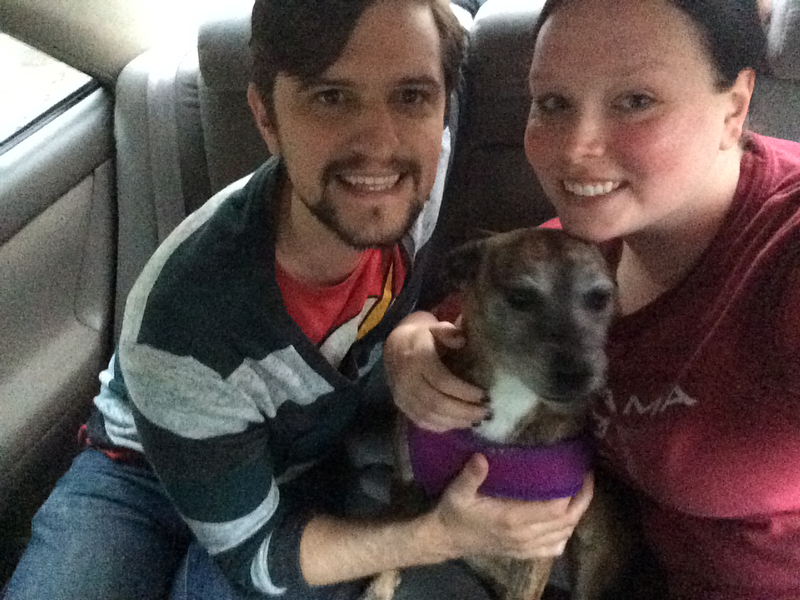 Lily is found! This photo was taken right after Sarah and Allan found Lily. 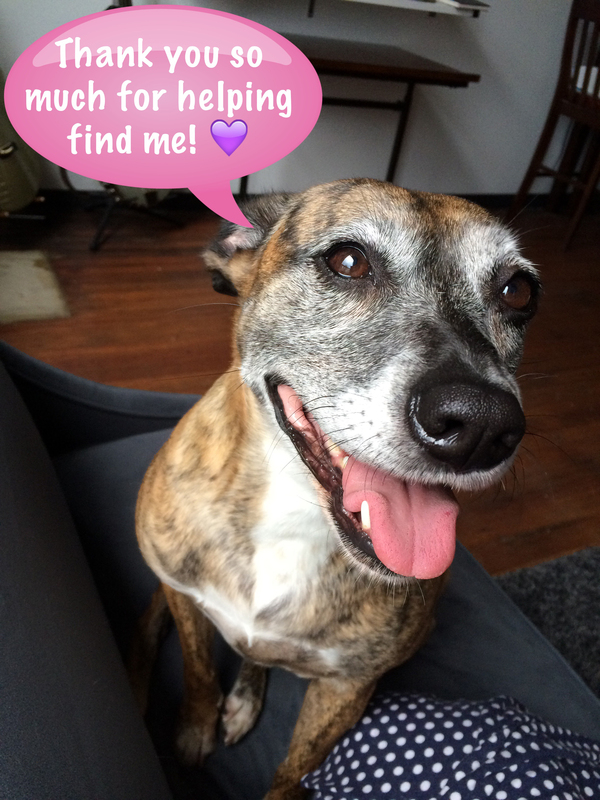 The process of finding your lost dog is an exhausting one, but it’s so rewarding. Don’t give up and don’t lose hope. Your dog wants to be found and is out there somewhere waiting for you to come get it. 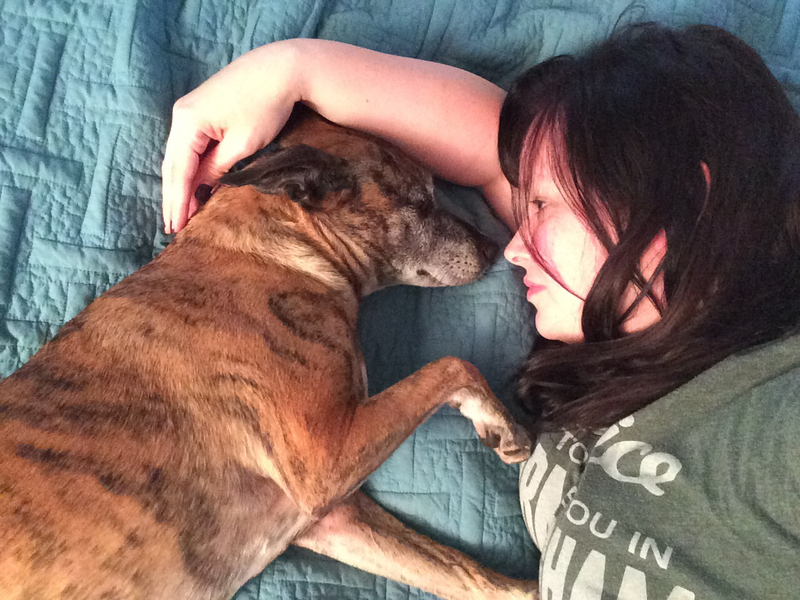 All of your hard work will be well worth it once that fur-baby is back in your loving arms! Tomorrow, we will share the last post in the “Finding Lily” series.